This quick review was provided by Maria, whose son is allergic to Peanuts and Tree Nuts. We always make a point to eat at The Plaza our first and last day at Magic Kingdom. We have been going here for at least 8 yrs now, and The Plaza has never disappointed us. It is one of the most allergy friendly restaurants you can find. 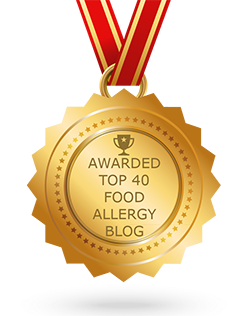 My son has a peanut and tree nut allergy. When we get seated, our waitress asks us about our allergy. She then brings over the book of food with all the ingredients, while we wait for the Chef to come to our table. Chef Ken, is the greatest Chef there. He comes and sits down with us and talks to my son about what he would like to eat. He goes out of his way to just talk about our trip, and he always remembers something about our past dining experience at The Plaza. With all the costumers that come and go there, it’s nice that Chef Ken cares enough to remember. 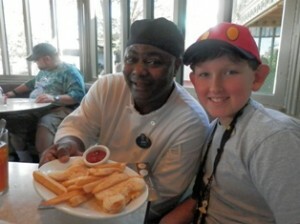 Our last trip my son had the grill cheese and fries. Chef Ken also offered to make my son more food if he was still hungery after his first dish. He also brought out fruit and salad for appetizers. The first dressing they put on the salad my son did not like, so he offered to bring out another salad with different dressing. For dessert Chef Ken makes him the Mickeylodeon with allergy friendly cookies. For the ice cream he opens a new container every time, so there is no chance of cross contamination. Chef Ken will also come out through out the meal to check on us and just chat. If you are looking for good food and a friendly, happy place, The Plaza is the place to be. We are planning our Nov trip and the first thing the family asks is, When are we going to The Plaza. 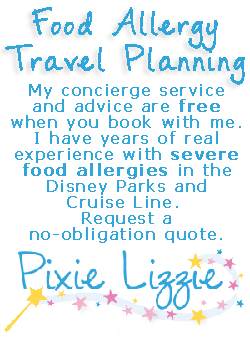 If you would like to review The Plaza or any Disney restaurant, submit a food allergy dining Quick Review. LOVE CHEF KEN! AND THE MEATLOAF! Oh my, how did I forget about the Wheat Allergy, my Mom has Celiac and The Plaza is wonder to her needs. Chef Ken has been dealing with us for years and The Plaza is great for all allergies. I can’t wait to book it for our next trip.